In a way, The Equalizer 2 is the absolutely perfect sequel. It's the old-fashioned kind, where the point isn't to recontextualise what we saw in the first film, back in 2014, to expand its universe, or to see what the ramifications are from what happened. It just tells another story using the same character doing what he does. It is almost entirely self-contained: there are a few individual shots that probably make more sense or have more resonance if remember them from The Equalizer, but these are few and inconsequential and would go by entirely unnoticed if you hadn't seen the first movie (literally the biggest of these is when Denzel Washington's character, Robert McCall, patiently unwraps a teabag from a napkin, a much bigger motif from the first film). The central relationship between McCall and semi-retired intelligence agent Susan Plummer (Melissa Leo) gains a smidgen more depth with knowledge of the last film, but only a smidgen. Otherwise, one could dive blindly into The Equalizer 2 and have absolutely not a ghost of a problem following along with everything that happens. On the flipside, if one has seen and loved The Equalizer, one can be contented to know that The Equalizer 2 is more or less identical. There are some fairly small-scale ways that it's better or worse than the original, and one large-scale one - it is much less creatively violent* - but I think it's not much of a claim at all to say that the net effect of this movie is exactly the same as the net effect of the original, with whatever points you take off for originality. And that, too, is a a great achievement for the movie sequel. That being said, this review comes to you from a person who found The Equalizer quite run-of-the-mill, and so I present my thoughtful summing-up of The Equalizer 2: "eh". The film opens with McCall having traveled to Turkey to violently murder a man on a train who kidnapped his daughter from his American ex-wife, as well as the man's lackeys We then jump over to Boston, where McCall has taken up work as a Lyft driver (the film is an awfully pushy commercial for Lyft), some time after transforming the Home Mart where he used to work into a brutal kill floor to punish wicked people for the crimes against innocents. Life as a Lyft driver has given McCall access to a wide range of humanity, and in a weird way, this is the very best part of The Equalizer 2: watching him drive around, having nice conversations with the people he meets. One of these, a regular customer, is Holocaust survivor Sam Rubinstein (Orson Bean), who has devoted his final years to recovering a beloved portrait of his sister that was taken by the Nazis and since has circulated among private collectors; others are folks who just drift in and out of his life, like an alcoholic who decides not to go to a bar under McCall's wary, warm eyes, or a soldier nervous about being deployed to Iraq who takes comfort in McCall's calm presence, or three loudly chattering children who fail to notice the driver beaming at them happily. It's sweetly humane stuff, very much unlike anything else I can name in the career of director Antonie Fuqua, but it works well under his hard style to seem earned & not just tackily saccharine; it also encourages Washington to do his softest, subtlest acting in the film. Obviously, a film about Washington being kind and interested in the lives of Lyft passengers would be a hard sell, so the violent action movie reasserts itself: first, in a fairly well-mounted scene in which McCall brutalises the rich assholes who've beaten a woman and tossed her in his backseat; it's the film's only strong combination of Fuqua-style fast-cut violence with Washington's more subdued, calming acting. Thereafter, the plot begins: Plummer has taken it upon herself to investigate the apparent suicide of a U.S. intelligence asset in Belgium, and while doing so, was killed in her hotel room. This has, as they say, made it personal for McCall, who has no other friends in the world besides Plummer and her academic husband Brian (Bill Pullman). He elects to reveal himself to his former partner Dave York (Pedro Pascal), who has thought him dead all these years, and investigate the deaths to avenge Plummer's murder. This is at least marginally less interesting than the situation in the first film, in which McCall was a kind of angel of vengeance: as the title doesn't really suggest, but makes sense once you've heard it, he takes it as his moral duty to "equalize" things on behalf of the poor and unfortunate, providing beatdowns to the people keeping them down (the films are based on a 1980s TV show which, as I understand it, was a weekly version of exactly this scenario, and The Equalizer 1 did feel awfully like an episode of a series; The Equalizer 2 is much less so, more like a Very Special Episode or a series finale). Making everything personal for McCall dilutes that a bit (there's a thin attempt at keeping it in play by bringing in a troubled artist kid from McCall's apartment, played by Ashton Sanders, but it feels extremely tacked-on), and makes this more like every other movie about an ex-special operative using his particular set of skills to get revenge on the bad guys who've wronged him and his loved ones. And it gets even more personal still as it goes along. Still, the stuff is basically the same: watch Washington be taciturn and badass, watch as he quite effortlessly tears apart a room of henchmen, repeat. There are fewer action scenes here than I recall in the first movie, and more time spent watching Washington look manfully sad; this makes it vaguely more interesting as a character story and vaguely less interesting as an action flick, but the Washington-is-badass material is exactly the same, and to his credit, Washington is far too good and reliable a movie star and actor to do anything but give his all to this boilerplate material. 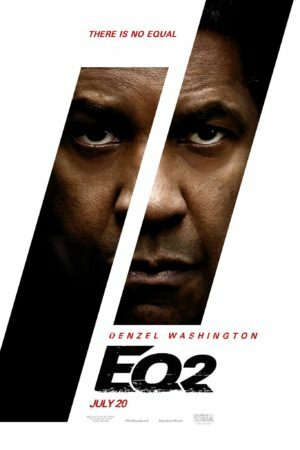 There is really no such thing as a Denzel Washington action movie that is completely unworthy of your time, and The Equalizer 2 has a pretty satisfying climax set against the chaos of an incoming hurricane in an evacuated Massachusetts fishing town, full of sound and fury, and it's the place where Fuqua's overly speedy style works well with the action (it's also not nearly as memorable as the first film's climax in a hardware store, but nothing was ever going to be). It's just very standard, very predictable, very much exactly the movie you think it's going to be: that is the whole of its appeal and also its most glaring limitation. *I leave it to the individual reader to decide if this belongs in the "better" or "worse" category.